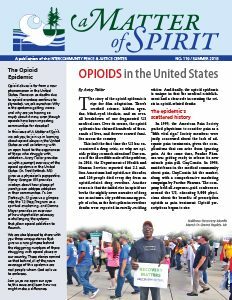 A Matter of Spirit (AMOS) is the quarterly justice journal of the Intercommunity Peace & Justice Center with analysis, theological reflection and action on justice issues. Our Governing Council selects four topics for the year, which are then given to our Editorial Board to determine articles and writers. Feel free to use the information contained in the current or previous issues of AMOS. If you find the information valuable enough to share with others, we ask that you note that the material was found in AMOS, published by the Intercommunity Peace & Justice Center. Also, please let us know how you are making use of A Matter of Spirit! 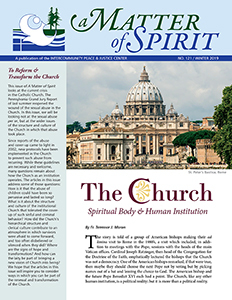 Read archived issues of A Matter of Spirit here. Back issues are available for most issues of A Matter of Spirit. To request copies, please call us at 206.223.1138 or email IPJC.